Paraneoplastic neurological syndrome (PNS) is a disorder caused by remote effect of the tumor on the nervous system and not by direct invasion of the tumor cells. These are caused by cross reactivity between the cytokines, peptides or antibodies secreted by tumor cells which leads to damage of normal neural tissue. , The spectrum of paraneoplastic syndromes due to the lung cancer is diverse and can affect the central nervous system, peripheral nervous system, neuromuscular junction as well as the muscle [Table 1]. PNS is more commonly reported in patients with small cell lung carcinoma whereas non small cell carcinoma (NSCLC) is more commonly associated with hypertrophic osteoarthropathy. NSCLC comprises of adenocarcinoma, squamous cell carcinoma and large cell carcinoma and these variants of the lung cancer are rarely associated with PNS. We hereby report a rare occurrence of paraneoplastic myelo-radiculoplexopathy as an initial presentation of squamous cell carcinoma of the lung. A 37-years-old female patient presented with complaints of pain in the left arm since three months followed by weakness a month later. The patient had dull boring pain around the left shoulder which radiated on lateral aspect of left arm. The pain progressed over 15 days to involve lateral forearm as well as the thumb and the index finger. This pain did not interfere in her daily activities and would respond partly to analgesics. After about a month, she noticed acute onset weakness in raising her left arm above the shoulder. The weakness progressed over a day to involve the entire left limb and she was unable to flex her elbow or grip objects. The patient also had decreased perception of hot and cold as well as texture of clothes. The patient had noticed that her left shoulder appeared thinner than the right and had history of occasional fasciculations in that region. There was no history of weakness or sensory loss in lower limbs or bladder bowel complaints. The patient had no history of fever, cough with expectoration or hemoptysis, trauma, weight loss, diabetes mellitus or hypertension. The patient did not complain of arthralgia, arthritis, rash or oral ulcers. She denied recent vaccination or unsafe sexual practices. With these above complaints, she consulted neurologist and was subjected to nerve conduction studies and electromyography and was diagnosed to have idiopathic left upper trunk brachial plexopathy. The patient was started on oral steroids, pain subsided transiently and the weakness did not respond to treatment. After about a month's therapy, she started noticing similar complaints in the right arm and at that time she was referred to our center for further evaluation and management. When the patient was presented in our outpatient department, she had developed painful weakness in both upper limbs (left > right) along with paraesthesia in both arms. On examination, she was conscious, oriented and had normal higher mental functions. Cranial nerve examination was normal. Wasting was noted around the left shoulder girdle and left arm. The patient had hypotonia in both upper limbs. The power was grade 2 at shoulder joint, grade 3 at elbow joint, grade 4 at wrist extension and grade 5 at wrist flexion in the right upper limb as per Medical Research Council (MRC) grade. On the left side, power was MRC grade 2/5 at shoulder joint, 2/5 at elbow joint, 3/5 at wrist extension, 4/5 at wrist flexion and hand grip weakness was noted. The patient had normal power in both lower limbs. Deep tendon jerks in bilateral biceps, triceps, supinator were absent, ankle and knee jerk were normally elicitable. Bilateral plantar reflexes were flexor and abdominal reflex were present in all 4 quadrants. Sensory examination revealed about 30% loss in pin prick sensation in left arm in C5-C7 dermatome. Joint position and vibration sensation were impaired in the upper as well as lower limbs. The patient had positive Romberg's sign. There were no cerebellar signs, thickened nerves, stigma of tuberculosis or syphilis. No lymphadenopathy or spine abnormality was noted. Complete hemogram, fasting blood sugar, renal and liver function tests were within normal range. Erythrocyte sedimentation rate was 24 mm at the end of one hour by Westergren method. C-reactive protein and anti- nuclear antibodies were negative. Anti-neutrophilic antibody (cANCA and pANCA), extractable nuclear antigens (ENA), serum were negative and cerebrospinal fluid (CSF) angiotensin converting enzyme (ACE) level was within normal limits. Microscopy of CSF revealed 10 cells, all of which were lymphocytes. CSF biochemistry showed protein 48 mg/dl and CSF sugar 67 mg/dl (corresponding blood sugar: 98 mg/dl). CSF for oligoclonal bands was positive. The CSF virology assessment for HSV PCR and IgM antibodies against herpes simplex, cytomegalovirus, Japanese encephalitis, varicella zoster virus, dengue and Epstein Barr virus was negative. Enzyme linked immunoassay (ELISA) for human immunodeficiency virus I and II was negative. Hepatitis B surface antigen (HBsAg) and anti- HCV antibody were also negative. Polymerase chain reaction for M. tuberculosis was negative. Cancer antigen 125 (CA-125) level was 45.39 U/ml (normal value below 35 U/ml). Onconeural antibodies could not be performed. The repeat nerve conduction studies revealed left sided pan-plexopathy and right upper trunk plexopathy. Electromyography was suggestive of denervation and showed fibrillation, fasciculations and large amplitude motor unit action potentials. Magnetic resonance imaging (MRI) of cervical spine showed mild swelling of the cord along with hyperintense signals within the spinal cord on T2 weighted images. In addition, hyperintensities of multiple radicles were noted bilaterally on T2 fat suppression images [Figure 1]. Incidentally, MRI revealed an ill defined, heterogeneously enhancing lesion (4 × 3 × 3 cm 3) in the left upper lung [Figure 1]. Computed tomography (CT) thorax showed well defined heterogeneously enhancing soft tissue attenuation lesion with speculated margin in apico posterior segment of left upper lobe [Figure 2]. Rest of the lung parenchyma was normal and no significant mediastinal lymphadenopathy was noted. CT guided fine needle aspiration cytology revealed malignant epithelial cells lying in clusters in a hemorrhagic background [Figure 3]. The patient received intravenous methylprednisolone 1 gm/day for 5 days followed by oral prednisolone 1 mg/kg/day for one month. After the confirmation of the lung malignancy on follow up imaging, she was referred to oncology and was advised chemotherapy followed by radiotherapy. MRI cervical spine [Figure 2] done after one month of steroid therapy showed disappearance of the cord hyperintensity but the mass lesion had increased significantly in the size (6 × 4 × 6 cm 3). The arm pain had responded but weakness persisted. The patient is currently receiving chemotherapy and radiotherapy. Bilateral brachial plexopathy has been previously reported due to Hodgkin's disease or during its therapy, immune mediated nerve damage in diabetes mellitus, polyarteritis nodosa and Henoch Schonlein purpura. ,,, Brachial plexopathy due to infiltration by tumor cells usually involves the lower trunk whereas immune mediated neuralagic amyotrophy is associated with upper trunk involvement. In our patient, the mass was found in the apex of the left lung, without infiltrating the plexus and hence the etiopathogenesis was probably paraneoplastic. Most paraneoplastic myelopathies (PNM) have associated encephalitis and have detectable titers of anti-Hu antibodies. Spinal cord edema, a non specific sign of PNM, may be noted with or without changes in the brain MRI. , In our patient, spinal cord edema was noted [Figure 1] but the brain MRI was normal. Anti-Hu antibodies are not specific for PNM. Various other antibodies have also been detected associated with myelopathy. , These antibodies may vary as per the primary malignancy. On the other hand, different onconeural antibodies have been detected in the same tumor. On the basis of MRI, longitudinally extensive transverse myelitis (LETM) is defined as spinal cord involvement of more than 3 vertebral segments. LETM is commonly seen in patients with neuromyelitis optica, multiple sclerosis, sarcoidosis, acute demyelinating encephalomyelitis, Sjogren syndrome, infectious diseases, paraneoplastic myelitis, etc. ,,, LETM is an important differential diagnosis for paraneoplastic myelopathy. , Recently in a series of paraneoplastic myelopathy, LEM was noted in almost 65% patients. This study also highlighted the fact that it is not uncommon to find elevated CSF protein, pleocytosis and oligoclonal bands even in paraneoplastic myelopathy. Most patients were poorly responsive to steroids as well as definitive therapy. In our patient, though follow-up spinal cord MRI T2 hyperintensity disappeared [Figure 2], the patient did not respond clinically and the weakness persisted. Mori et al., has also reported paraparesis with signal changes on spinal cord MRI due to PNS caused by squamous cell carcinoma of the lung. Ezka et al., reported mononeuritis multiplex as the first manifestation of the lung adenocarcinoma. Usually, myelopathy and radiculoplexopathy associated with malignancy is compressive in nature due to spinal metastasis or immune mediated as in PNS or due to radiotherapy. ,, Recently myeloradiculopathy with similar clinical presentation of bi-brachial weakness was reported in association with testicular malignancy and anti-Ma 2 antibody. In this case, we report a patient who had features of both myelopathy (loss of joint position sense, Romberg's positive along with spinal cord swelling) as well as plexopathy (weakness and sensory loss in upper limbs). To best of our knowledge bibrachial weakness due to paraneoplastic myeloradiculopathy has not been reported in the literature till now, especially in squamous cell carcinoma of the lung. In absence of clinical manifestations of primary tumor, PNS is a difficult condition to diagnose and requires high degree of suspicion. It is an important differential diagnosis in cases of LETM, unexplained neuropathy or neuromuscular diseases. One should consider its possibility if symptoms are rapidly progressive and poorly responsive to the therapy. In our patient, PNS aided early diagnosis of the patient before the spread of tumor. Even though the tumor has responded to chemotherapy but the bi-brachial weakness remained unchanged. Dalmau J, Rosenfeild MR. Paraneoplastic neurologic syndromes. In: Fauci AS, Braunwald E, Kasper DL, Hauser SL, Longo DL, Jameson JL, et al, editors. Harrison's Principles of Internal Medicine. Vol. 1, 17 th ed. New York: McGraw Hill Medical; 2008. p. 623-7. Molina-Garrido MJ, Guillén-Ponce C, Martínez S, Guirado-Risueño M. Diagnosis and current treatment of neurological paraneoplastic syndromes. Clin Transl Oncol 2006;8:796-801. Heinemann S, Zabel P, Hauber H. Paraneoplastic syndromes in lung cancer. Cancer Ther 2008;6:687-98. Mori H, Yamada O, Ohno Y, Kaito D, Yanase K, Ito F, et al. Paraneoplastic neurological syndrome in a patient with squamous cell lung cancer. Intern Med 2013;52:1967-70. Ekiz E, Ozkok A, Ertugrul NK. 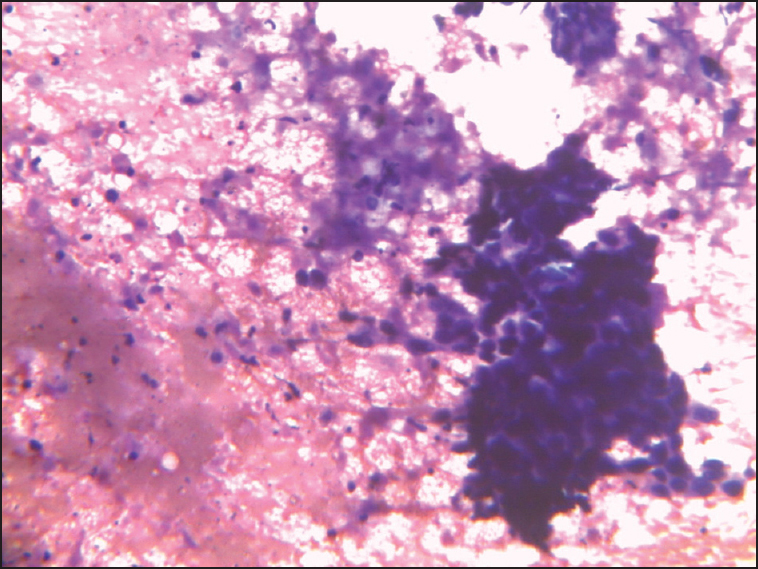 Paraneoplastic mononeuritis multiplex as a presenting feature of adenocarcinoma of the lung. Case Rep Oncol Med 2013;2013:457346. Mohr JR. Distal field infarction. Neurology 1969;19:279. Gamez J, Cervera C, Codina A. Flail arm syndrome of Vulpian-Bernhart's form of amyotrophic lateral sclerosis. J Neurol Neurosurg Psychiatry 1999;67:258. Katz JS, Wolfe GI, Andersson PB, Saperstein DS, Elliott JL, Nations SP, et al. Brachial amyotrophic diplegia: A slowly progressive motor neuron disorder. Neurology 1999;53:1071-6. Misra UK, Kalita J. Overview: Japanese encephalitis. Prog Neurobiol 2010;91:108-20. Leis AA, Stokic DS. Neuromuscular manifestations of West Nile virus infection. Front Neurol 2012;3:37. Berger JR, Espinosa PS, Kissel J. Brachial amyotrophic diplegia in a patient with human immunodeficiency virus infection: Widening the spectrum of motor neuron diseases occurring with the human immunodeficiency virus. Arch Neurol 2005;62:817-23. Nalini A, Desai A, Mahato SK. Flail arm-like syndrome associated with HIV-1 infection. Ann Indian Acad Neurol 2009;12:127-30. Muley SA, Parry GJ, Ercan-Fang NG. Isolated bibrachial plexopathy in a patient with type 2 diabetes. Diabetes Care 2005;28:2591-2. Antelo MJ, Facal TL, Sánchez TP, Facal MS, Nazabal ER. Man-in-the-barrel. A case of cervical spinal cord infarction and review of the literature. Open Neurol J 2013;7:7­10. Allan SG, Towla HM, Smith CC, Downie AW, Clark JC. Painful brachial plexopathy: An unusual presentation of polyarteritis nodosa. Postgrad Med J 1982;58:311-3. Yilmaz C, Caksen H, Arslan S, Anlar O, Ataş B, Güven AS, et al. Bilateral brachial plexopathy complicating Henoch-Schönlein purpura. Brain Dev 2006;28:326-8. Ko K, Sung DH, Kang MJ, Ko MJ, Do JG, Sunwoo H, et al. Clinical, electrophysiological findings in adult patients with non-traumatic plexopathies. Ann Rehabil Med 2011;35:807-15. Dalmau J, Graus F, Rosenblum MK, Posner JB. Anti-Hu-associated paraneoplastic encephalomyelitis/sensory neuronopathy. A clinical study of 71 patients. Medicine (Baltimore) 1992;71:59-72. Lee CH, Bharwani L, Sullivan T. Paraneoplastic necrotizing myelopathy in a patient with newly diagnosed diffuse large B cell lymphoma. World J Oncol 2011;2:195-8. Murphy SM, Khan U, Alifrangis C, Hazell S, Hrouda D, Blake J, et al. Anti Ma2-associated myeloradiculopathy: Expanding the phenotype of anti-Ma2 associated paraneoplastic syndromes. J Neurol Neurosurg Psychiatry 2012;83:232-3. Wingerchuk, DM, Lennon VA, Lucchinetti CF, Pittock SJ, Weinshenker BG. The spectrum of neuromyelitis optica. Lancet Neurol 2007;6:805-15. Verma R, Lalla R, Patil TB, Mehta V. Acute myeloneuropathy: An uncommon presentation of Sjögren's syndrome. Ann Indian Acad Neurol 2013;16:696-8. Verma R, Patil TB, Lalla R, Kumar M. Extensive acute disseminated encephalomyelitis in a young girl responding to intravenous methylprednisolone. BMJ Case Rep 2013;2013. pii: bcr2013009222. Trebst C, Raab P, Voss EV, Rommer P, Abu-Mugheisib M, Zettl UK, et al. Longitudinal extensive transverse myelitis - it's not all neuromyelitis optica. Nat Rev Neurol 2011;7:688-98. Rezania K, Roos RP. Spinal cord: Motor neuron diseases. Neurol Clin 2013;31:219-39. Flanagan EP, McKeon A, Lennon VA, Kearns J, Weinshenker BG, Krecke KN, et al. 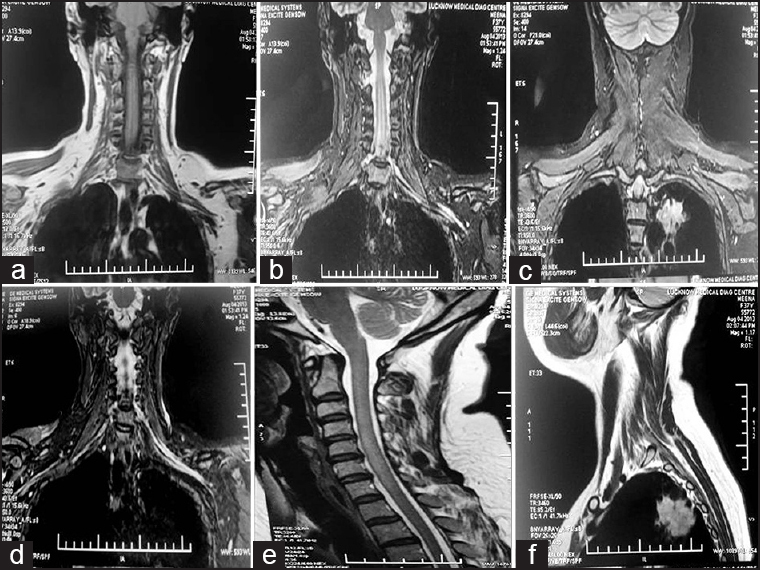 Paraneoplastic isolated myelopathy: Clinical course and neuroimaging clues. Neurology 2011;76:2089-95. Graber JJ, Nolan CP. 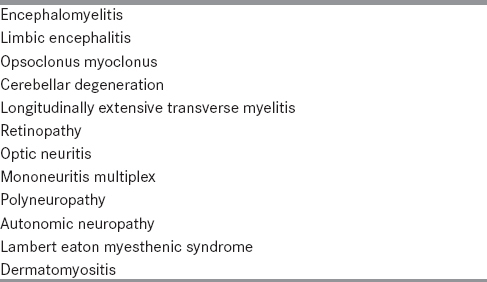 Myelopathies in patients with cancer. Arch Neurol 2010;67:298-304. Jaeckle KA. Neurologic manifestations of neoplastic and radiation-induced plexopathies. Semin Neurol 2010;30:254-62. Nishioka K, Tanaka R, Tsutsumi S, Shimura H, Oji Y, Saeki H, et al. 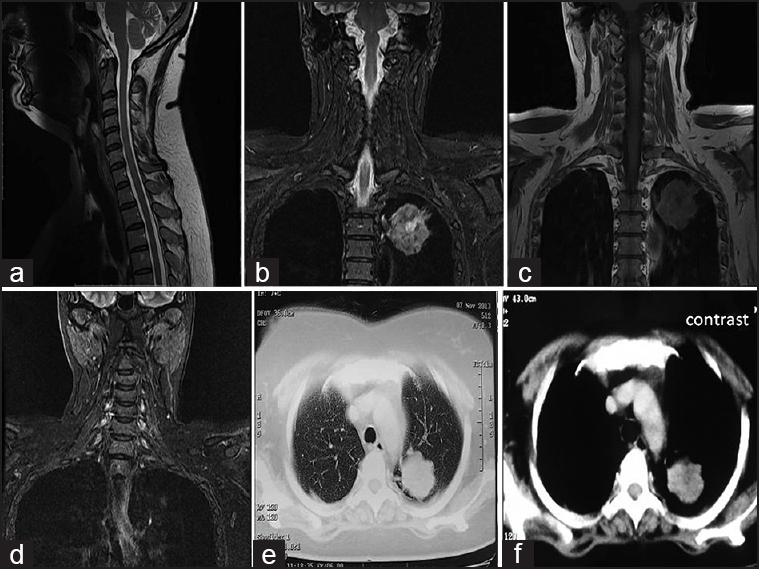 Longitudinally extensive transverse myelitis with intramedullary metastasis of small-cell lung carcinoma: An autopsy case report. Case Rep Neurol Med 2013;2013:305670.